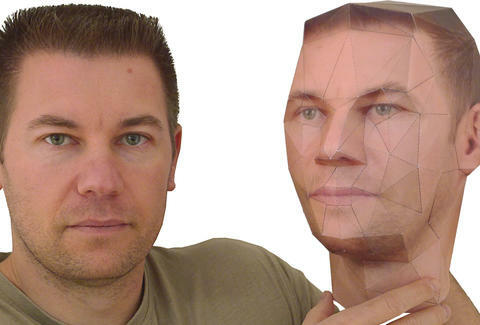 A chance for people besides your mom to see the model potential in your face, Paper Kit's new service can transform any noggin into an eerily realistic, life-sized, color, three-dimensionally folded paper polyhedron based solely on submitted photos. It works like this: upload three headshots (one each from the front, left, and right), run 'em through their special 3D rendering software, then either print out the resulting PDF or have them send one. Just cut it out, fold, and assemble into the finished figure using a glue stick, stapler, and tweezers -- pretty innocuous tools compared to the ones a doctor'd need to give you an actual model-worthy mug.